Geordi is kidnapped by an intellectually challenged group of alien pirates. Meanwhile, Picard and Wesley bond while taking a shuttle trip together. Why are Data, Riker, and La Forge reassuring Wesley about the nature of the Academy entrance exams? Wesley's already taken them once, so he knows what to expect. Worf is right about being more cautious concerning the Pakleds, but Riker makes a big mistake by ignoring him. Wesley says Picard is not comfortable around him--that Picard would prefer Riker as company--but Wesley doesn't realize that Picard has already told Wesley more than he's told anyone else, including Riker, by telling him about his heart condition. Wait, when did the Klingons join the Federation again? Did they all get drunk off blood wine and join for like a day or something? The coded messages the bridge crew give to Geordi are completely incoherent. I don't know how Geordi understood it, but I guess there's specific protocol for these kinds of communications that we, as the audience, aren't really privvy to. Riker's fake-out solution reminds me of the TOS episode "The Corbomite Maneuver." It would have been a heck of a lot cooler if the doctor who saved Picard turned out to be Dr. Crusher. I enjoy this episode a lot, because the Pakleds amuse the hell out of me and because I think the interplay between Picard and Wesley is poignant. It's not the greatest episode of all time or anything, but it's definitely not the steaming pile of dog crap Dennis Russell Bailey thinks it is. The story Picard tells will later be shown in full detail in the excellent episode "Tapestry." 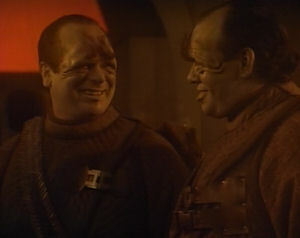 Dennis Russell Bailey, along with David Bischoff and Lisa Putman White, so hated this episode that they decided to write their own episode and prove they could do better. They wrote "Tin Man."